There has been no effort by the regime to return home tens of thousands of Oromos and Somalis who were displaced due to recent ethnic clashes. 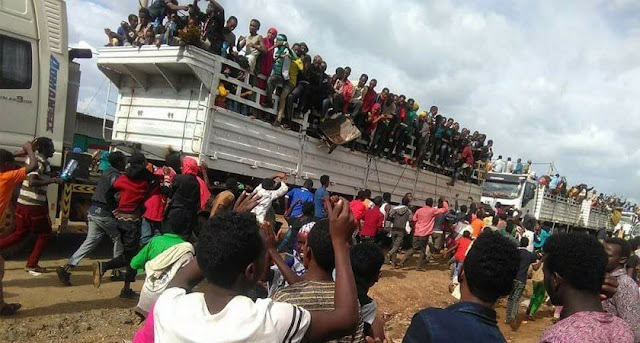 According to sources who closely follow developments in Eastern Ethiopia, the regime, that stands accused of instigating the violence, has done nothing to return home the over 70,000 thousand Oromos sheltered in camps or the unknown number of Somalis displaced from the Oromo region. Neither is there any plan to help and compensate the displaced. Observers of the development say the two regional governments were setting a bad precedent in letting the crises to go out of hand. Ethnic violence sparked by dispute over resources and land between the two communities has resulted in the displacement of thousands of people and scores of deaths in the last few weeks alone.